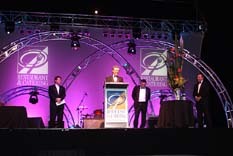 The 2004 Restaurant And Catering Awards were held at The Adelaide Convention Centre on Monday 26th July 2004. Production by Novatech Production Services Adelaide. CLS Tri Truss Circles purchased by Novatech earlier this year.